Still weary from days fighting malaria, I made my way north from the coastal city of Cotonou, Benin to Abomey, the capital of the once feared Dahomey Kingdom. I made the trip north despite the obvious diversion from my direction towards South Africa. My reason for going off track was twofold. Firstly, I wanted to avoid the busiest of the Nigerian borders and the highway the cuts near Lagos. That highway is famous for its treachery; it’s one of the most dangerous roads in the world in regards to highway collisions. By diverting north I could cross at the much less hectic border and avoid the chaos of Lagos in the process as well. Secondly, I really wanted to visit the town of Abomey, one whose past empire has been famed as one of the most barbaric in all of West Africa. I’m guided into the grounds of the palace, a UNESCO site which covers over 4 square kilometers and encompasses more than a dozen palaces and temples. The first palace I see has painted stone carvings engraved into the wall. The first depicts a man beating the other with a dismembered leg, the second a horse wearing a decapitated head as pendant, and the third of a man with a gun pointed into the mouth of a chained enemy. 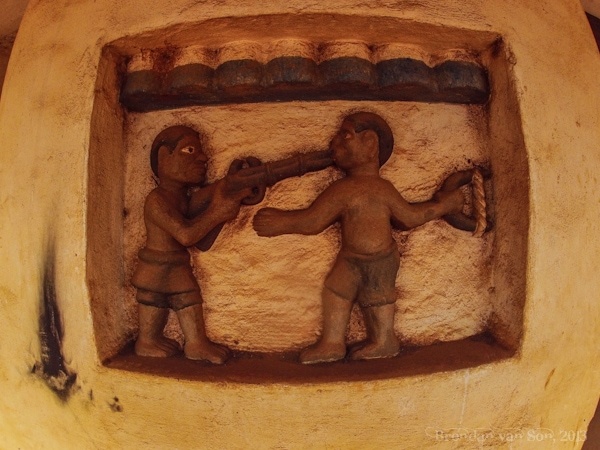 I wasn’t allowed to take pictures in the palaces or museums in Abomey… but I managed to sneak this one. The guide, who carries a bit of a cold attitude, points to a round temple now covered by a tin roof. She points to the side of the temple where the now dried out corpses of other animals and their skeletons lay alongside the building. The guide continues in saying that when the king dies his wives are meant to die with him. The temple, in which I’m allowed walk around, is the tomb of the former king’s wives. While he is said to have had as many as 200 wives, when he died they decided to sacrifice 41 of them to the afterlife. They were lowered into the basin of the temple, drank a glass of poison and died there below where my feet now stand. Casually, she points at the costume of a man holding a saber She explains that this was the executioner, and that he may have had the most stressful job in the world. If he didn’t cut the head of the enemy clean off in one single chop, he himself would have his head removed as punishment. Soldiers also had to live by high standards. Prior to leaving to fight they were to promise to return with a certain number of heads. If they came back with even one short, they had to give their own to make up the difference. During the years that the Portuguese held claim to these lands, the Dahomey Kingdom was active in trading slaves with the Europeans. They held a creed in which they were believed that they always must expand their territory. As such, captured enemies that weren’t beheaded were often forced to make the long journey to the coast of Benin and then into the hands of the colonial powers. The Dahomey were certainly a bloody people, unafraid of getting their hands messy in battle. In fact, the Dahomey Kingdom held the lands in this part of South-western Benin long after the French had taken control of the country. When the French built their railway they were forced to avoid the kingdom and build their national railway 10 kilometers to the east just to avoid intruding. Eventually, however, the French did take this powerful empire down, but not before the last king could torch nearly the entire city of Abomey. 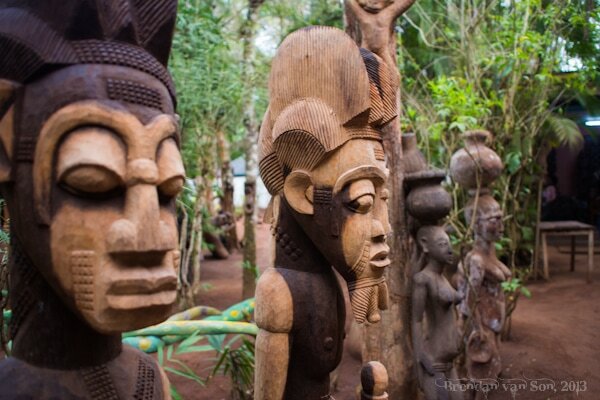 When travelling Africa, it’s often easy to forget that the roots of kingdoms stretch back thousands of years. Colonialism has done so much to wash the continent clean of these great empires, and history often doesn’t reflect them nearly as clearly as the colonial. 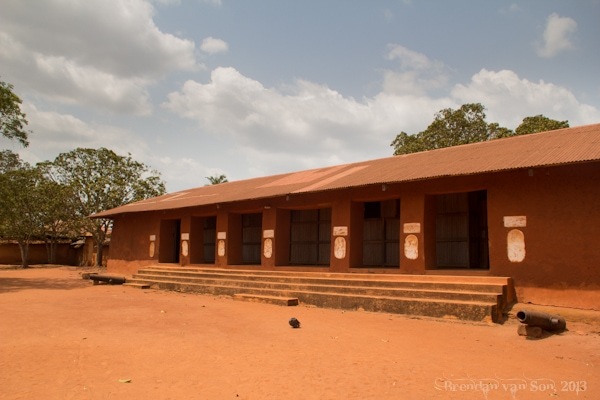 But walking through Abomey, it’s nearly impossible not to feel that raw energy of the past. I’ve never been the type of person to get a buzz from going through museums or galleries, and walking through the temples of blood and sacrifice in the Dahomey Kingdom proves again what I’ve always known: there is nothing like getting out and learning about the world from the source itself. Great article Brendan, the pre-colonial kingdoms of Africa (like the Bornu Empire) had an amazing history and a sophisticated society that most westerners are totally ignorant of (even if some of their customs seem shockingly brutal to us). Both the British and French acted hideously towards many of these small kingdoms all along the Niger River for the best part of 150 years, so however bloodthirsty we think they are we “civilised” folk aren’t much better! As you and I know Tom, the Europeans didn’t like having the blood directly on their hands, but they were the most brutal of all the empires of the world. Amazing read. Great pictures. Thanks Brendan! Get outta here with your orientalism. If you want to write on blood, decapitation, human sacrifice, why don’t you cover the actions of King Leopold’s Free Congo State. Very informative thank you! My husband and I are going to visit January 2020. We just found out his ancestry lies here!